Do you love these little Japanese egg sushis? Make tamagoyaki – Japanese grilled eggs – at home. I love tamagoyaki. Do you know it? Those little bricks of bright yellow rolled omelette on rice, wrapped with a nori belt? 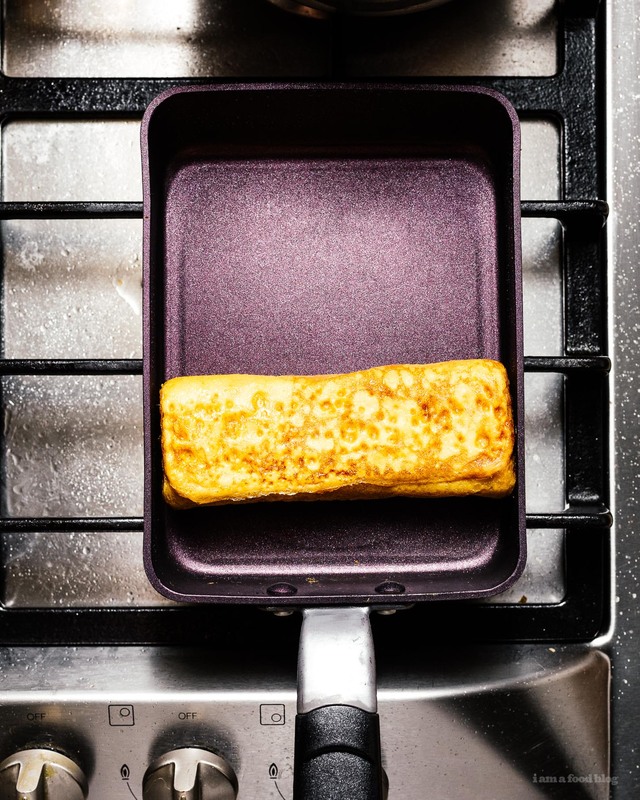 They’re kind of unassuming, but tamagoyaki – which is means “egg grill” in Japanese – is an art. Good tamagoyaki should be solid, yet still layered, with no burnt parts. Mike likes to judge sushi restaurants by their saba/mackerel sushi, but I use tamago as my benchmark. 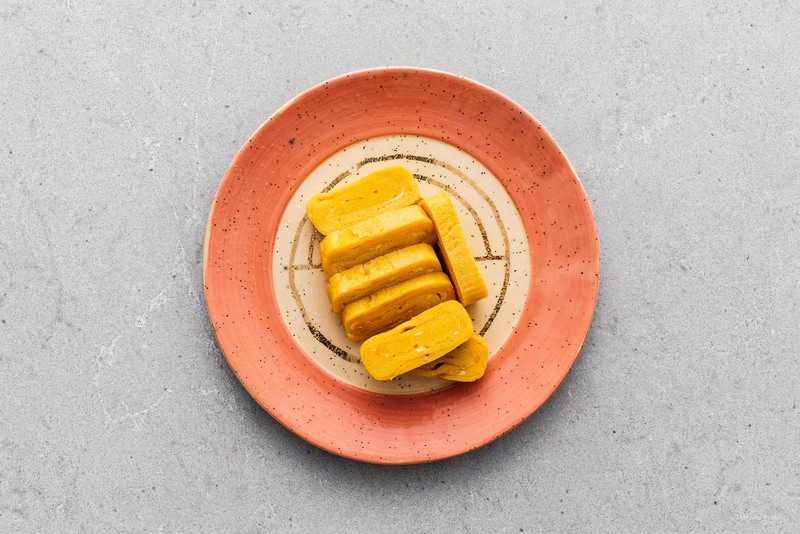 Good tamagoyaki is sweet and savory and juicy and seriously good. 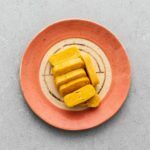 It’s a little tricky to make at home because you want the layers of egg to adhere to each other, but you don’t want any browning because the pieces of sliced tamago should be a uniform yellow color. I went a bit far with these guys and they’re a little burnt. Basically I failed. Oops. They tasted good though. I’ll probably update this post with some better looking tamago soon. You win some, you loose some, am I right? 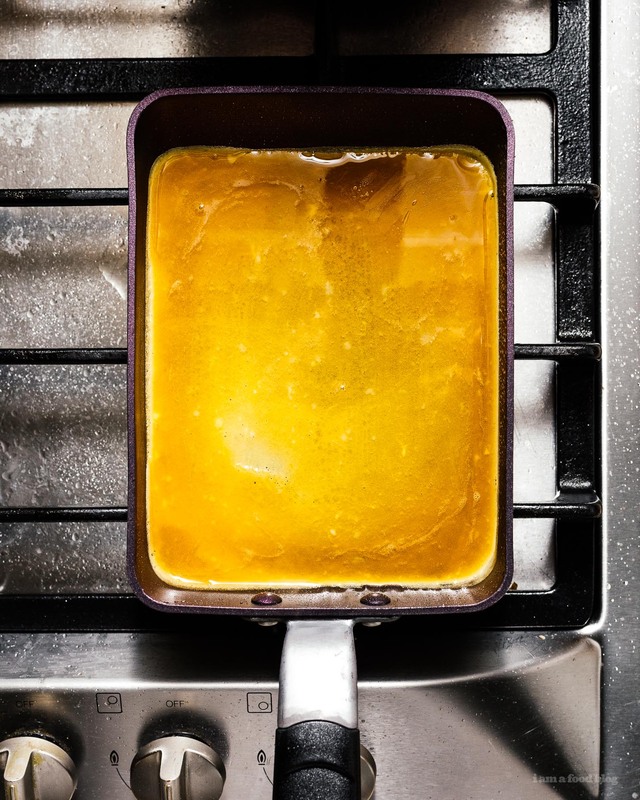 Oh, one last thing: I have a cheap tamago pan that I bought online, but I’ve seen people make tamago without a regular frying pan, so I know it’s possible – you just need to trim off the edges. Crack your eggs and lightly mix them. You don’t want to incorporate air into them so the best way is to use chopsticks: stir them gently without whipping, but make sure that the eggs and yolks are completely homogeneous. Add the mirin, sugar and soy and gently mix in. Use a paper towel to evenly spread a bit of oil in your tamagoyaki pan. Heat it on medium low heat, then add the eggs so they cover the bottom of the pan. After 2-3 minutes, the egg will start to cook and solidify. The eggs don’t need to be entirely cooked, in fact, they should be a tiny bit moist on top so that the egg sticks to itself. Using chopsticks or a spatula, fold the egg over onto itself twice, like how you would fold a letter into thirds. Don’t flip the eggs, just push them to the end of the pan. 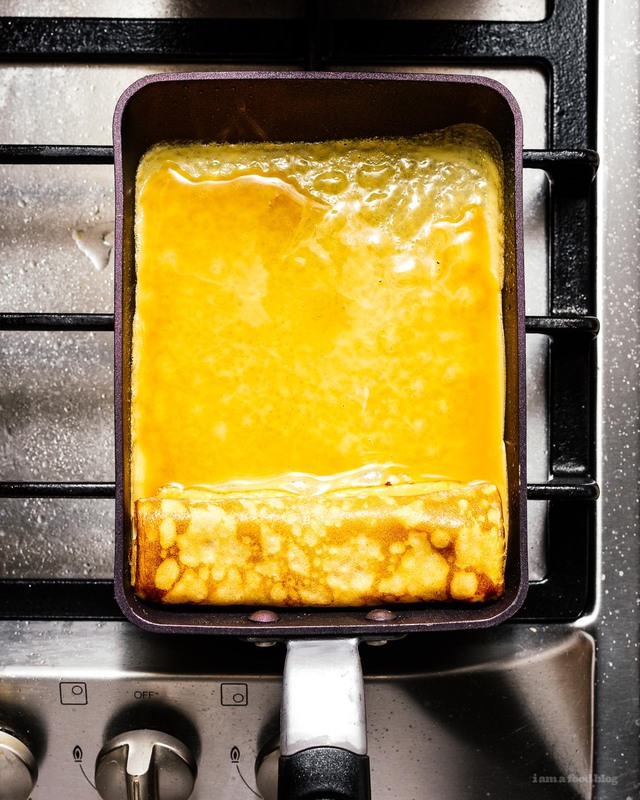 Use your oily paper towel to spread a tiny bit more oil in the pan and add a bit more of the eggs. Lift up the log of already cooked eggs so that the raw eggs are touching them. When the new layer of egg is almost cooked, fold the eggs over onto themselves again. Repeat until all the eggs are used. Wrap in saran wrap and using a sushi mat, press the tamago into a rectangle shape. Let cool completely, slice and enjoy! Alternately, you can make this in a regular frying pan, and just trim off the edges.